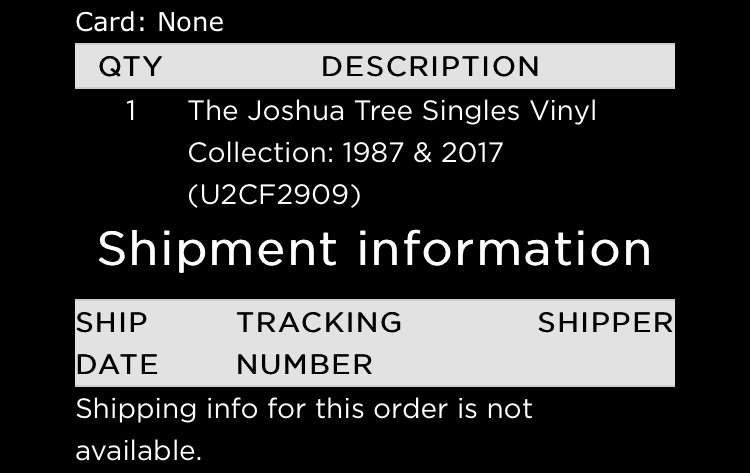 I didn't get a mail but now in "Shipment Information", it shows Feb 23 like ship date I don't know what it means, are vinyls on their way? 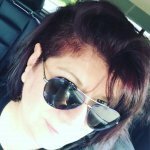 Others have posted such info - yes, this is the news you/we want to see! Only issue is the one corner is bent . I haven't opened the plastic yet. Feels like the records are ok. I just checked the order details on mine and it looks like it's on it's way (date said 6 Feb). All I thought was "About frigging time!" Anyone else from Australia gotten theirs yet (or waiting)? Renewed my sub in Jan 2017. 2017 gift was announced via email on May 3, 2017. Redeemed my gift on May 4, 2017. .... As of today, Feb 27, 2018... no gift, no shipping info. No shipping notification, but this was leaning against my apartment door last night (in a UPS package, of course). Thankfully, I don't have any curious neighbours! 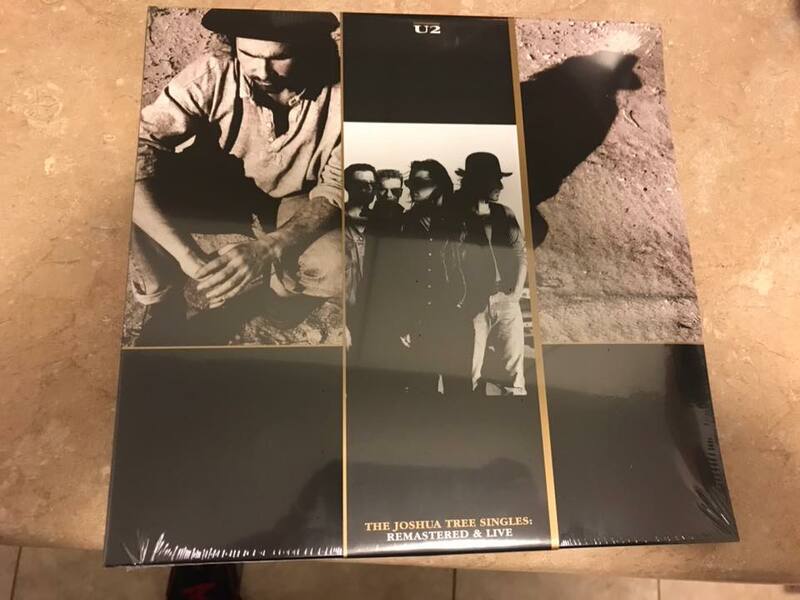 I got mine, but don't have a record player - is there a download available? Sure wish they'd offer CD versions to those of us who haven't gone back to vinyl. Im think is on is way!! I still haven't recieved anything and no updates on the shipping info. 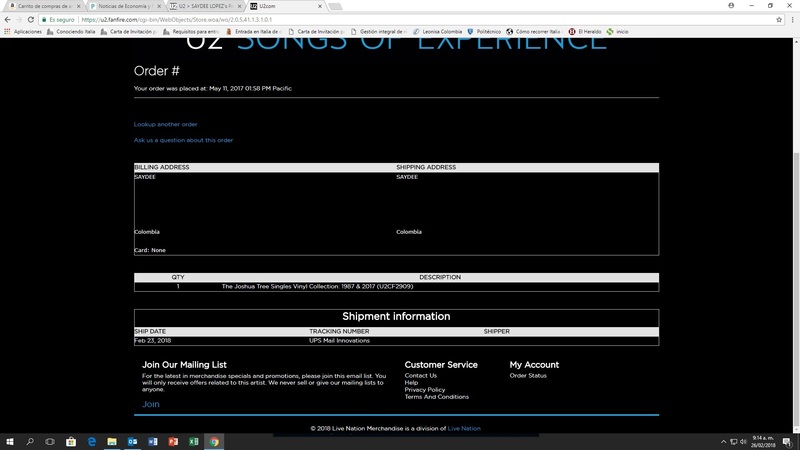 I sent a message on Sunday to the customer service (if you can even call it that) asking if I would even be recieving them this month and to nos surprise I haven't gotten a response. Yes, we've been discussing that here for quite a while. The short answer is yes - plenty of people have gotten theirs first who redeemed after many others. 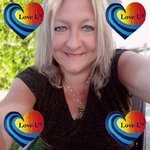 Bigwave has said he is posting a thread very soon for those who redeemed long ago but whose requests seemed to have fallen into a void (e.g., yours, mine, and many others here as well). I have an update in my account info - apparently, mine was shipped yesterday. So, those in the same boat as I was, check your order status information in the U2.com shop ASAP. Mine arrived today in UK as well. My husband should have some coming too....not sure what we’ll do with them both...! 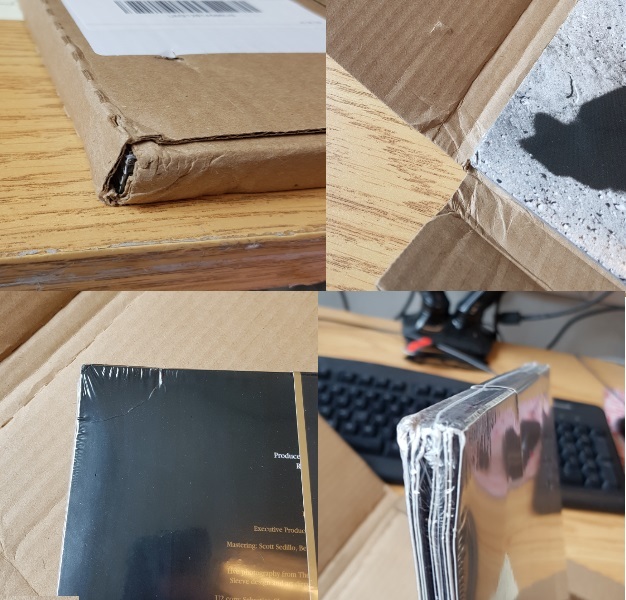 Received my vinyls today! A pity one corner of With Or Without You is bent. At long last mine just arrived in Scotland. I got another copy of the blanket response emails saying "Production is now underway again and dispatch of the gift will begin again mid to late February 2018" Why the f would they even bother to send me that?!?! It's the last day in February and there is no update on my shipping info. It's obvious mine are not shipping this month. Don't lie to me flat out like that when I ask you if mine will be shipping this month! come on guys this can't be this difficult or do you just don't care ? I renewed my subscription and I wish I hadn't. I WON'T be doing so again. 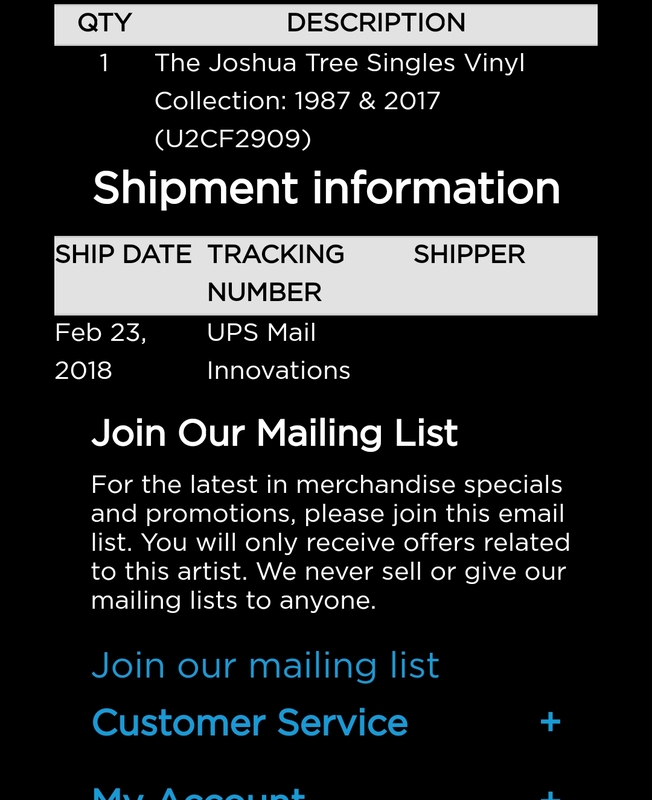 I still haven't received my singles, no update on tracking info/email, and the only response I got to the 3 emails I sent in was a single message stating that they were shipping in "late February" with 3 business days left I can say I highly doubt that will happen with the way this has been going and I'm getting angrier by the day at this situation. They have taken my money and given me nothing in return. Highway robbery. It seems many other fans are in the same situation, ie waiting...waiting and waiting. Surely it shouldn't take this long to recieved some plastic!!! Have emailed numerous times without a satisfactory response from whoever? How to loose legions of fans loyalty and subscription cash. Do the band know about this? I think not. Disrespectful. Won't be subscribing next time. Well unless there is some strange miracle then my subscriber item won't be arriving today (not that I expected it to). Which means another month has passed and I have no answer as to why I haven't received it or where it is. I want my goddamn money back and every time I send an email asking about the where abouts of my item or a refund I've gotten one of those bs blanket emails about them shipping in February and they completely ignored my request for a refund. This is absolutely appalling.